As a fun way to test the new opening suite feature, I conducted a fast match between the very strong Komodo 3.0 chess engine and the built-in Java engine of Chess for Android using the "beat the masters suite" (a version with 251 test positions). Komodo is clearly much too strong for my own humble engine and the suite was meant to test the quality of moves found by chess engines, not as an opening suite. Nevertheless, since some positions give one side a very strong advantage, it seemed like a fun way to test the new opening suite feature. The outcome was as expected: Komodo won most games and only a few draws occurred. However, Chess for Android had one victory. In the position below, with black to move and only half a second thinking time per move, Komodo played 1... Rxe2, which yields a lost position (black should have played 1...hxg6). The possibility to play engine tournaments from both sides of any external book in PGN format, as explained in this blog posting.Layout and formatting improvements in the UCI analysis output window. Light grey board color.Relaxed FEN parsing to accept non-standard, but frequently occurring omissions in the FEN string.Ability to view simple cross-table while tournament is in progress (>> button). Using the new upcoming opening suite feature in Chess for Android, I conducted a tournament between the most recent Android versions of Stockfish, Komodo, and Critter (32MB cache, 1s./move) from both sides of the "Silver Opening Suite" (300 games total). A screenshot of the tournament in progress is shown below (also note that the upcoming version improved the layout and display of the engine analysis window). When the tournament is over, a summary of the results is shown. The results organized in a cross-table are shown below. Stockfish is the clear winner. Komodo now comes in third (probably because v3 honors fixed time per move better than previous versions). To eliminate the effect of opening books, it is a common practice to test the strength of chess engines by letting them play from both sides of a pre-selected set of opening positions. Earlier versions of Chess for Android already supported the option to play engine tournaments from both sides of 50 positions of the built-in book (yielding 100 games total between each engine pair). The upcoming 3.0 release will add the option to play both sides of any external book in PGN format, such as the famous "Nunn Positions" (published by GM John Nunn) or the "Silver Opening Suite" (published by Albert Silver). To use this feature, long press the notation window, and select "UCI Engine Support", followed by "Engine Tournament". Then select the "all games from both sides of external book". Don Dailey and Larry Kaufman's Komodo version 3 is now available for Android (ARMv5TE) at UCI engines for Android. A quick one second per move tournament ended in favor of the previous version 2.03 (possibly because Don fixed the movetime command to honor the given time exactly; previous versions would sometimes use more time, which may have skewed estimates of their strength a bit). 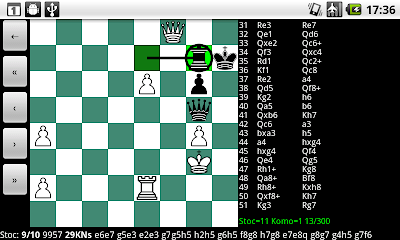 I just released version 2.9.4 for Chess for Android, available from the Android market or as direct download. This version introduces the much requested "infinite analysis" mode for an imported UCI engine, in which the engine reports its analysis of positions without actually making moves. To enable this mode, change the level to free play, as shown in the following screenshots. If an UCI engine is imported, its analysis of the current position will appear below the board. The user can freely play through previous games or make new moves. When at the end of a game still in progress, pressing the ">" button will play the best move found by the UCI engine. Changing the level, or unloading the UCI engine will exit the "infinite analysis" mode. Lucas added the movetime command to DoubleCheck (the stop command is still lacking) which enabled conducting a few quick 1-second per move matches to determine the strength of the engine. 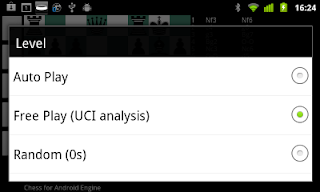 I compiled Lucas Braesch's DoubleCheck 1.1 for Android (ARM) and put it on the UCI Engines for Android website. 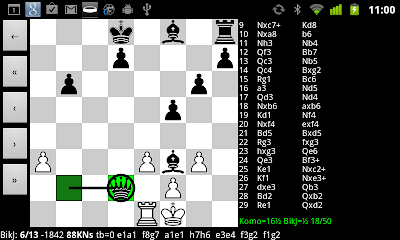 The engine works reasonably well in Chess for Android. However, because the UCI command movetime is not implemented yet, it plays almost instantaneously, making matches to determine its strength less useful at the moment.